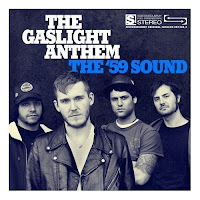 The Gaslight Anthem is a punk alternative band from New Jersey. On August 19th they will release their second album "The '59 Sound." The Captain was privileged to get a sneak peak at this gem. On the album, lead singer Brian Fallon has a voice that is reminiscent of Springsteen. His voice is straightforward and neat with a dash of reverb and delay. While this may have punk fans throwing up on themselves his voice also reminds me of Brandon Flowers in The Killers second album "Sam's Town." The guitar, bass and drums are kept simple. The tempo and beat are catchy. Overall, this is just a nice album. My favorite track is the title track "The '59 Sound." The opening guitar riff is very sweet and the pre-chorus as Fallon sings "The chains I've been hearing now for most of my life" as it bursts into a gritty melody is awesome. Track 3 "Old White Lincoln" is also a beauty and words to the chorus "You wear high top sneakers and your seven tattoos" are still ringing in my mind. I highly recommend this album. You do not have to be a high top wearing tattood punk lover to enjoy it. I just picked up "the '59 sound" and I agree with you 100%, it is a punk album but still very accessible t that mass audience! Great Blog BTW! We need more user friendly alternative reviews! Nice review, and thanks for the link on your page! !